Yesterday in church, we reflected on “church.” The prayer of the day asked our merciful God to allow his church, gathered together and enlivened by his Holy Spirit, to be an effective witness to his power throughout the world (Collect from Proper 16, in the BCP). 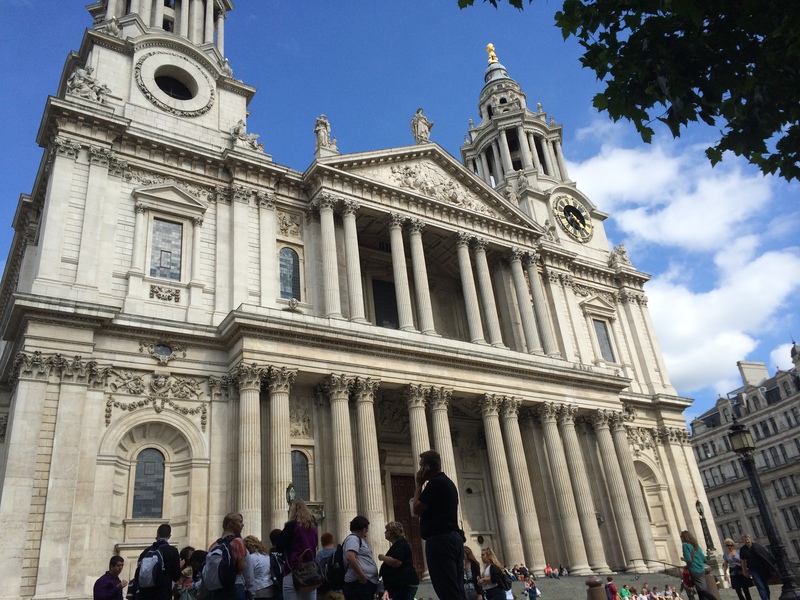 gratuitous St. Paul’s, London shot; via me. Our Epistle reading, from Romans 12, highlighted how each member of God’s church has a specific job–not anyone doing everything. In the Gospel, Peter proclaimed Jesus the Messiah, Son of the living God, and Jesus, in turn, declared the foundation of the church. Our hymns and psalm addressed the same theme. Maranatha–Come, Lord Jesus; save your church. This entry was posted in quotation, worship by Emily. Bookmark the permalink. Schisms are indeed nothing new. Thanks be to God for the Holy Spirit and the promise of all things being made new.